India’s pharmaceutical manufacturing has ballooned to a US$35 billion industry — and nearly a third of that value is generated in the state of Gujarat, according to Viranchi Shah, the chairman of the state board of the Indian Drug Manufacturers’ Association (IDMA). Now, with a suite of public and private infrastructure initiatives and incentives rolling out, Gujarat’s pharmaceutical business is attracting a steady stream of foreign investors and manufacturers. Gujarat has established itself as an industrial powerhouse in the last two decades. Between 2004 and 2012, the state’s economy has grown at 10 percent a year, beating the national average of 8.25 percent. The state’s pharmaceutical industry has grown at an 11 percent rate over the last two years, currently employing more than 85,000 people. Industry in the state produces 53 percent of India’s medical devices, and 40 percent of its pharmaceutical manufacturing machinery. Pharmaceutical exports from Gujarat have grown sixfold in 10 years, from US$562 million in 2006 to US$3 billion in 2016. “When companies look at India to acquire or build a factory, Gujarat is one of their top destinations,” claims Shah. India’s government-sponsored “Make in India” campaign — designed to nurture domestic production over dependence on countries like China and to increase India’s exports — has helped spur Gujarat’s growth. The Goods and Services Tax (GST), which was enacted in July 2017, has also played a role by consolidating a series of state and federal taxes that had made Gujarat’s goods more expensive — and consequently less competitive with goods from the north and northeast of India. The government has also streamlined foreign direct investment channels. And Gujarat’s Food and Drug Administration and manufacturing-regulatory-compliance levels are ranked among the best in India. To press its advantages, Gujarat has set up 47 Special Economic Zones with government-supported tax benefits and has dedicated four clusters of zones to the pharmaceutical industry. Factories there — many of which are operated by top medical companies like Sun Pharma, Zydus Cadila, Torrent Pharma, and Intas — are already manufacturing formulations, APIs, devices, biogenerics, vaccines and more. “The infrastructure is at an international level,” says Shah. The Gujarat Industrial Development Corporation (GIDC), a public-private coalition, allotted special industrial parks to pharmaceutical and device manufacturing last year. The parks incentivise investment by providing free access to common utilities, effluent and water treatment plants and basic testing facilities, cutting companies’ costs by up to 50 percent. According to Shah, many global pharmaceutical patents are expiring in the next five years, creating a market opening for generics that could be as large as US$200 billion. India already manufactures 40 percent of the generics sold in the U.S., a KPMG report says, and demand within India is growing by more than 10 percent yearly. 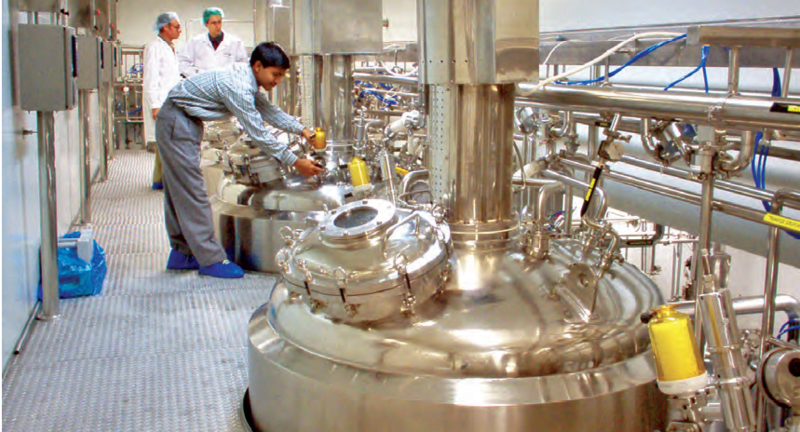 With its strengthened pharma-production infrastructure, Gujarat is especially well-positioned to take advantage of the market growth, Shah insists. “We’ve never seen this kind of opportunity,” he says.